The whole crew went to SJ for our big appointment and we even made it early...which hardly ever happens!! When we walked in the doors, we saw the Volunteens and all three of the kids went running straight towards them. Ingram, of course, had to go check in with Mrs. Gloria, get his arm band, and have his daily chat with Mrs. Penny before he could go play with the girls and the Volunteens. They got to color fish thingies, make bracelets, and play games with the Volunteens before we headed over for our appointment in E Clinic. I wasn't sure if all three of them would come with us to the clinic because they were having so much fun with the teens, and sure enough, Lindsey ran back while we were waiting in the clinic and played until the teens had to leave. Our name got called and off we went like a row of ducklings to Room 4 to hear the results...Scans are clear!!! Dr. Gajjar explained all the findings of the MRI and spinal fluid and said that there was no clear sign of tumor in either the pictures or the fluid...and so now we breathe. The MRI did see Ingram's sinuses again and they noted that he had an infection in one of his sinus cavities but it wasn't as bad as the last scan. We'll see the ENT again to discuss that further, but Ingram's not symptomatic right now; we're just attributing it to our wonderful Memphis weather. After about another half hour of talking specifics and all the possible questions we could think of, we headed to the cafeteria for a celebration lunch of sorts. After the kids finished their lunch, all three of them took off running back to where the Volunteens were and found another group had set up at the tables and they were...painting!!! You'd think today was like a jackpot of sorts for our kids with fun stuff before our appointment, good results in our appointment, and then more fun stuff after our appointment. I finally had to drag them out of SJ (totally normal occurrence) and we headed towards the house with a stop at the ice cream store, another totally normal occurrence of course! So we spent the rest of the day thinking about the results and thanking God for keeping Ingram free of disease at this current moment. There's a sense of relief since he had been throwing up so much this past month, but the last month before scans is always an extra stressful time; it seems there is always something new worrying us that the tumor has returned. But God gives us comfort in different ways each time. Sometimes it's through the doctors' words. Sometimes it's through the words, actions, and prayers of our friends. Sometimes its through an indescribable peace that is beyond our understanding. We value all of these things greatly. The Kids With Dr. Gajjar! Love, A Shark, And An Owl All Made With Handprints! We were so exhausted when we got home from the lake but I think we finally caught up on all the laundry with every one's help. It rained all day Monday morning so we stayed at home and beau was so happy to have us at the house. He loved that Noah took care of him last week while we were gone, but he really liked busting through the bedroom doors to find the kids in their beds! Once the sun came out, we headed for haircuts for the girls; even though Ingram didn't get a haircut, he still got ice cream afterwards. Ingram also went swimming and played ping ping Monday night before we made him go to bed. Tuesday was a full day with appointments at the dentist and the orthodontist for the girls; Ingram loves going and watching the girls get worked on and talks to everyone. He told everyone he could about wakeboarding, kneeboarding, tubing, and skiing last week at the lake and had me show the pictures to them all too. While we were at the dentist, Ingram had climbed up in the extra tall chair and was watching a show on my phone. Yep, it's coming...he leaned over and all of a sudden crashed to the floor and it was so loud!!! Everyone came running in the room and thankfully he was fine, just a little scared from the noise and fall itself. We also got to go to SJ as a family for a super fun photo shoot that had all of us jumping...literally jumping. At one point, we were trying to see who could jump the highest and two of the five of us landed on their rears! Ingram had a super cool surprise waiting at our door when we got back and he was soooo excited! Danny Moeschle and the guys from Flintco Constructive Solutions (they're building the new tower at SJ that will house lots of stuff including the new Proton Radiation Beam) had sent a book "The Construction Zone" that was signed by author Richard Sobol to Ingram since we were not at SJ the day of the party. They also included the coolest bright yellow Flintco vest, a hardhat, and a pair of sunglasses that can help Ingram dress up as the guys he loves to watch from the cafeteria windows every time we eat at SJ! Needless to say, he worn it just about non stop since he opened the box. Bright and early Wednesday morning after a not-so-good night's sleep, I had to wake Ingram up and get out the door by 6:30am! He was so funny on the way to SJ for his scans and said that he was going to take a nap on the way since he was "so tired!" After Ingram sailed through getting poked and weighing in (at a massive 40 pounds) we headed over to the MRI area and waited and waited and waited for our turn. All four of the MRI machines were running behind so Ingram was able to play Jenga and to play with cars in the waiting room. Once we were back in our Sedation Room, Ingram picked out a Hot Wheels movie to watch while everything gets ready. Daddy also enjoyed a little Hot Wheels movie before our sweet Child Life Specialist Amanda came in and asked Ingram if he'd paint a picture for the walls. Ingram had so much fun painting a dinosaur with a laser shooting fireballs and it will make its debut on the walls of St. Jude in the near future! Soon though he was put to sleep and spent a couple hours in the MRI machine, had a spinal tap, and even had a little bit more of a nap before he woke up in the recovery room. While we were waiting (which seemed like it was forever), Craig and I sat around and attempted to plan Team Ingram stuff, but we of course were very sidetracked with Ingram being in the machine. Once we got to the call to come back to Recovery about 3 hours after we left him (it's normally around 2 and a half hours), he made up for the extra time delay by being extra funny! It was hilarious trying to figure out what he was saying and even more amusing when we let go of him on accident and he "leaned" over and bonked the side of the bed since his head was at an incline. Seriously, as stressful and exhausting as all of the waiting is, Ingram is just so sweet when he's coming out of anesthesia. Once Ingram had eaten and woken up more, we left and headed towards the house and picked up the girls along the way. They had each stayed with a friend and had so much fun, but the first question from each of them was "Were they clear?" Sadly, we couldn't give them an answer yet but they were so glad to see Ingram that I think it okay for the time being, especially knowing that they were going back with us Thursday for our appointment with Dr. Gajjar and to hang out with Ingram all day. So until then...we wait and wait and wait some more. Entertaining Himself While The Girls Get Haircuts! The Newest Member Of The Flintco Team! Getting All His Measurements Taken! The Biggest Achievement So Far...40 Pounds! Waiting To Scare Nurse Lizzie With The T-Rex Picture! She "Hates" Dinosaurs And Ingram Does It Every Time!! "Mom, Quit Taking Pictures, I'm Trying To Paint!" Ingram's Dinosaur With A Fireball Shooting Laser! As He Woke Up From Anesthesia! First Thing He Puts On After We Get Home From The Hospital! Monday to Sunday July 15th to the 21st, A Totally Awesome Week!!! Instead of a regular post this week, our fun was just too great so we're going "Picture Style" since a picture is worth a thousand words! 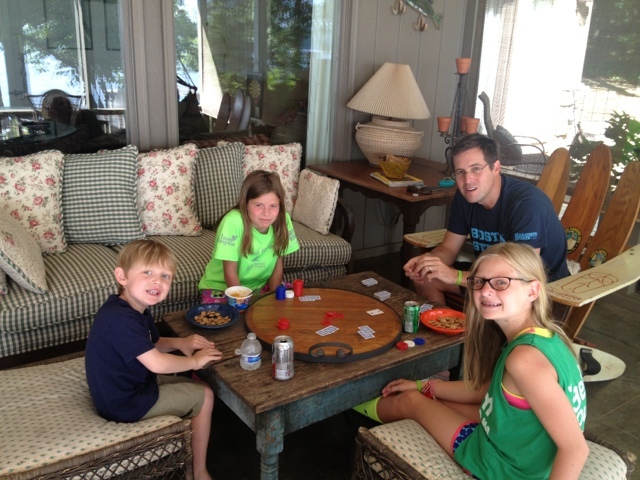 We're thankful for our friends Tommy and Brokke Shipmon for letting us stay at their lake house for the week in Iuka Mississippi. Sometimes we tend to fuss and get fiesty with each other the weeks and days leading into a scan, but being away like this helped make that Scanxiety seem a little less harsh. This week was much like our Make-A-Wish trip to Disney World where we just hung out as a family and let our hair down for the week..literally! Ingram's MRI and Spinal Tap, plus a full day of appointments are Wednesday the 24th, so keep him and the whole family in your prayers please. (40 Minute Sunset Cruise) To Start A Week Long Vacation Before The Sun Goes Down! Immediately After We Got To The Lake, This Crew Was Ready To Get In! They're In Their Clothes And Loving The Lilly Pad Just Before The Sun Went Down! The Triple Threat Hitting The Water! Oh Yeah, This Is Going To Be A Great Week! This Quickly Became A Nightly Tradition...Card Games And Tinker Toys! Awwww...Look Who I Found Just Waking Up And Snuggling! Very Late Breakfast of Cookie Crisp And Macaroni! First Rides On The Jet Ski And YoLo Board! Armed And Ready With A Water Gun And Two Paddles! Queen Of The YoYo (Aka The YoLo)! 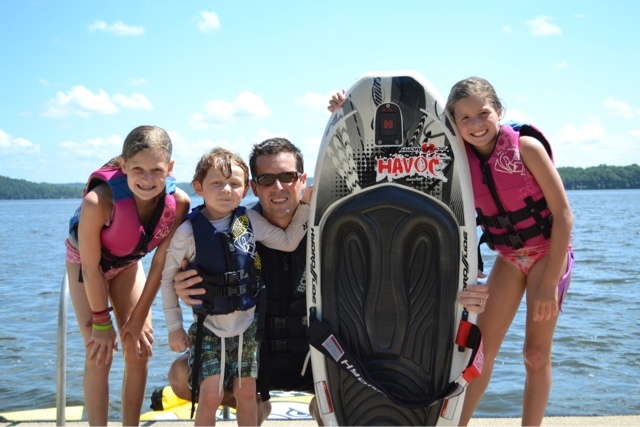 Getting Ready For Take-off For The First Knee Board Ride! He Got Up On His Second Try And Kept On Going...All Week Long! 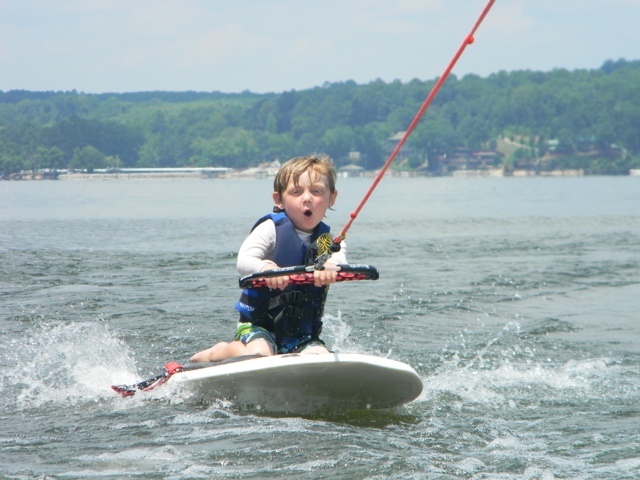 I Think We Can Safely Say Ingram's Conquered The Knee Board! It's A Bird, It's A Plane, It's Super Ingram!! Setting Out On The Smoooooth Water First Thing In The Morning! Double Trouble Chilling On The Tube! Tubing With The Cousins After They Came Down From Jackson! Triple Trouble...Lindsey, Ingram, And Brett! Brett Getting Up On The Knee Board For The First Time Too! The Less Famous Fab Five! Ready To Go Again After A Snack Break! 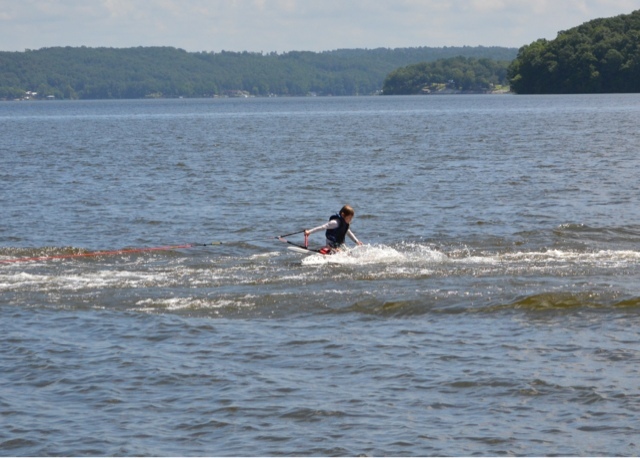 Lindsey The Great Doing What She Does Best...Riding The Waves On The Knee Board! 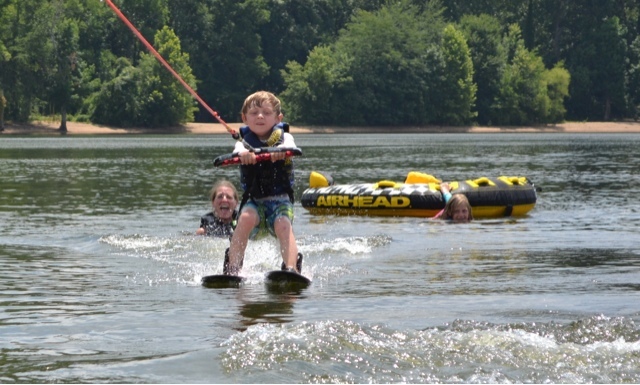 No Hands For Madison While She Surfs On The Knee Board! 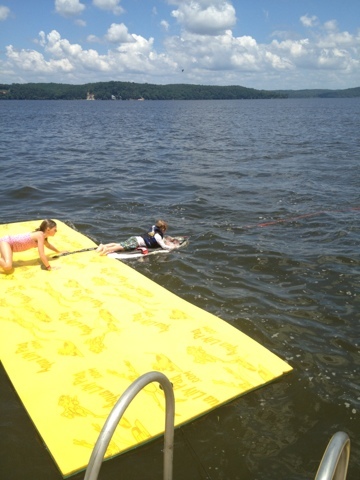 Carley Up On The Wake Board! Madison's In Shock That She's Up On The Real Skis, Not The Kid Ones! Seriously, Madison's Looking Like A Cheerleader In All These Pictures!! Why Stop At The Knee Board?? 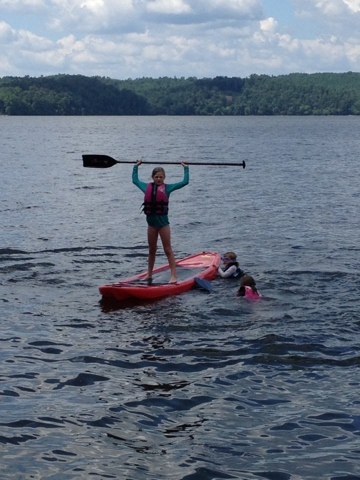 Moving On To Water Skis And This Time, Up On The First Try!! Back On The Knee Board For The Hundredth Time! A Million Frequent Flyer Miles Were Awarded To These Three! Just Taking A Break Watching The Girls Get Thrown Off The Tube! So Much Fun Tubing, No One Was Watching The Rope! A Shorter Rope Does Make It More Fun, Right?? We Also Drove Into Jackson For The Fab Five To See Granny! It Was One Of Those Moments That Melted My Heart! The Oldest Grandchild From Each Side...Such Sweet Girls Loving On Their Granny! Attempting To Make A Pyramid? Or Maybe He Just Wanted To Jump On His Girls! I'm Pretty Sure They're Hanging On For Dear Life! 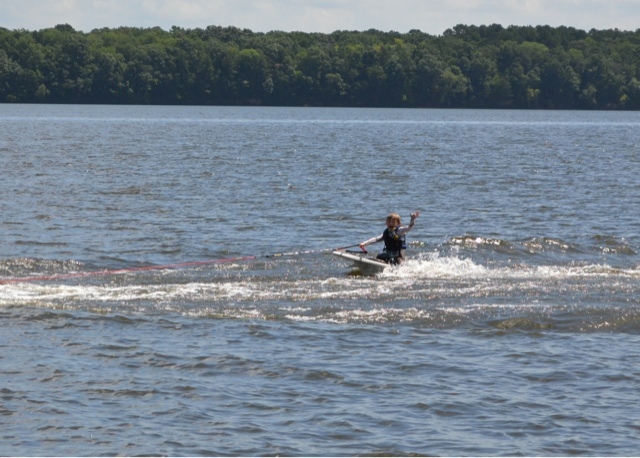 Madison Showing Us How It's Done On The Wake Board! This One She Was Playing It Safe And Landed! And She's Still Going Up At This Point!! But Crashed On The Landing! 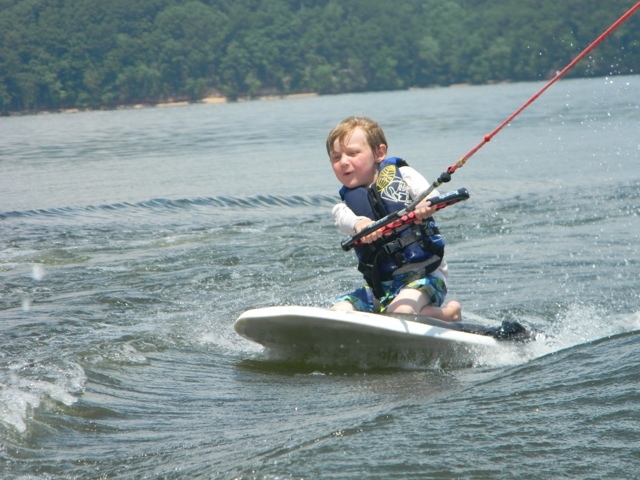 Madison Inspired Ingram To Try The Wake Board Too! Total Shock When He Once Again Got Up On The First Try!! Tubing Together For Their Last Ride Around The Lake! Ingram has a full day of appointments including his MRI and Spinal Tap Wednesday the 24th, so keep him and our whole family in your prayers please. We loved our time at the Lake and will keep extra busy these last couple days before scans so that we don't sit around and think too much.